What to do in Ostuni and in the Itria Valley (Puglia)? What to do around Ostuni (Itria Valley)? To visit Ostuni, in Italy , is to discover the famous “white city” of Puglia. Perched on 3 hills, the Citta Bianca can be seen from afar and is one of the best places to visit during a stay in Puglia . It symbolizes the starting point of the Itria Valley , known for its villages classified among the most beautiful Puglia and its vast expanses of olive trees. With our Top 10 things to see and do in Ostuni, walk its pretty streets and do not miss any places of interest. 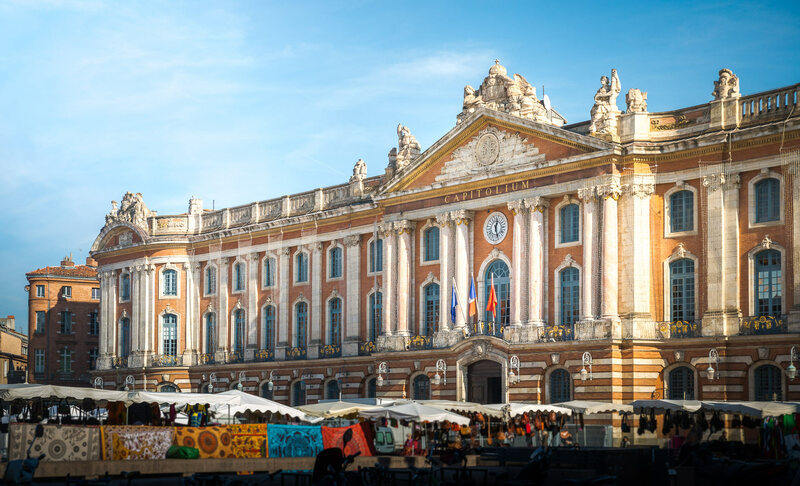 Follow our itinerary to visit the city and its surroundings in 1 or 2 days. As always, I have also prepared the list of the best hotels in Ostuni . Why not take advantage of your trip to the south of Italy, to sleep in a masseria , these old farms typical of Puglia? 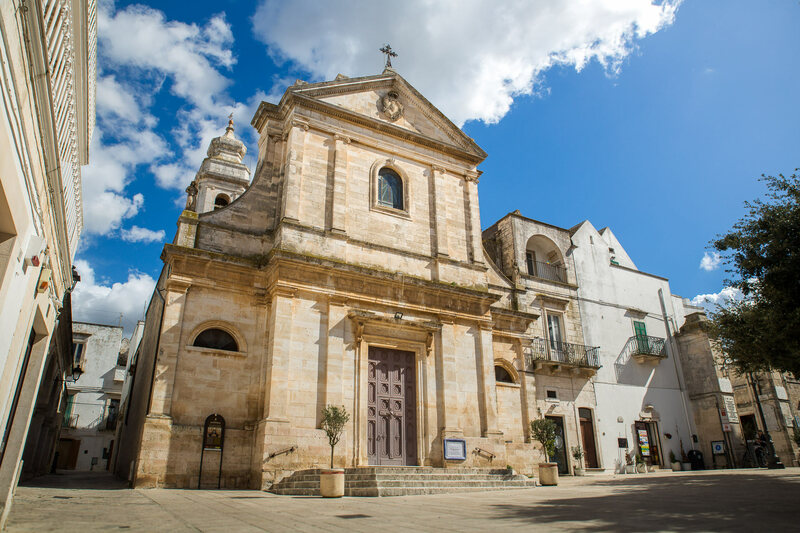 So, what to see in Ostuni and in the Itria Valley? 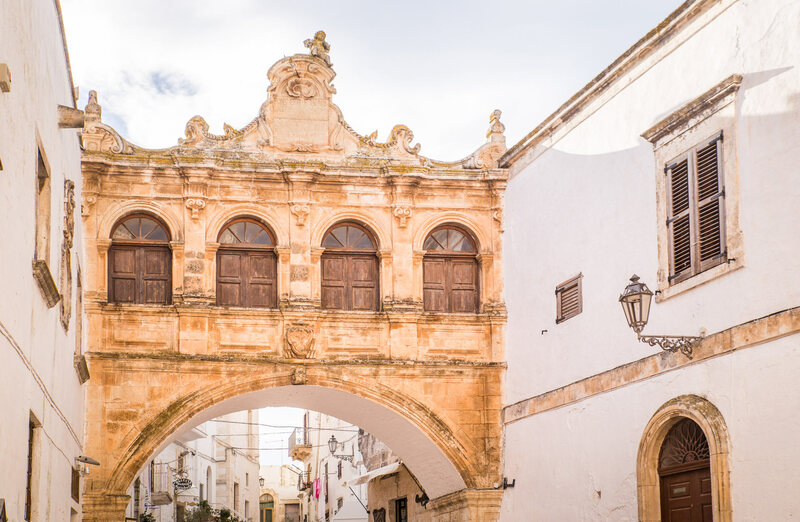 As everywhere in Puglia and in the towns and villages of Italy, most places of interest to see in Ostuni are concentrated in the historic center. 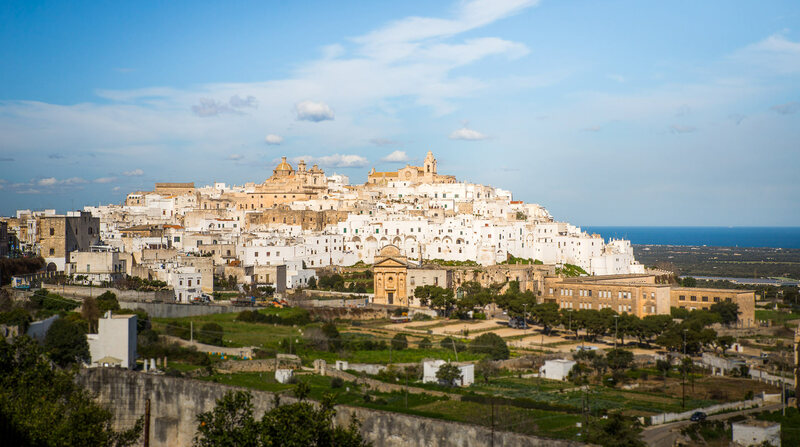 The old town of Ostuni, however, has a particular charm thanks to its whitewashed houses , from which the city derives its nickname of “white city”. In the Middle Ages, the practice of covering lime facades was developed, the goal being to bring a little light in the narrow streets. Today this tradition is lost a little but the city has retained all its cachet. In the historical center of Ostuni, you will be able to stroll narrow alleys, passages and stairs, leading you to the main monuments to see like the cathedral or the palace of which I speak to you in detail just after. Everywhere you will find pretty craft shops or souvenirs, small restaurants and cafés where to stop for a drink. Enjoy the many views of the surroundings of Ostuni, the surrounding countryside and the Adriatic Sea, just 8 km away. To visit Ostuni, park your car just before the entrance of the city , on one of the paid car parks. The city, and more particularly the tourist center, is a maze of rather narrow or one-way streets when access to cars is not simply forbidden, in short a galley to park (assuming you find a place) ! 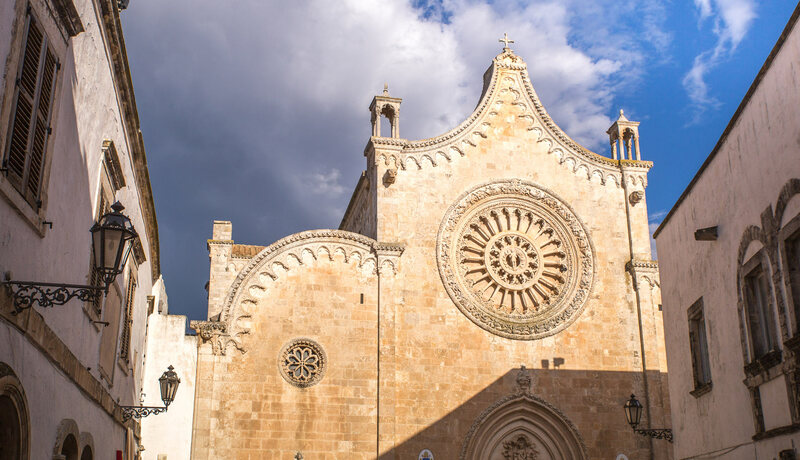 The Ostuni Cathedral is the main tourist attraction to see in Ostuni. It is at the top of the highest hill , so you have to climb a little in the streets to discover it. Built from the 15th century and dedicated to Santa Maria Assunta , it took almost a century for it to be completed. 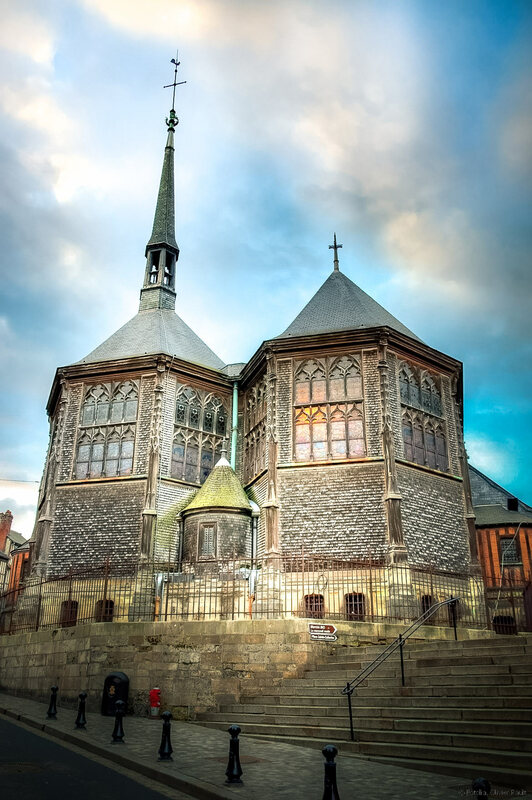 It has a rather original exterior , Romanesque-Gothic style, mix of related curves and convex . We can also admire a beautiful rose window in the heart of which sits Christ surrounded by 7 cherubs. Its 24 spokes represent, in turn, the 24 hours of the day. 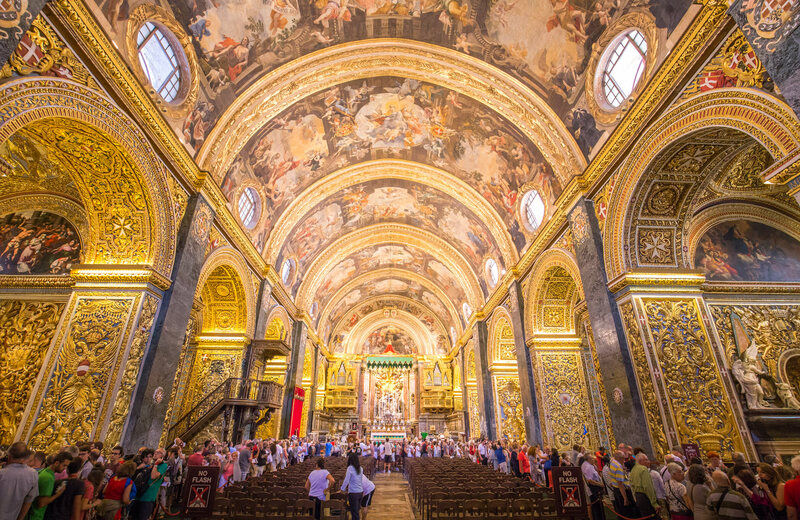 The interior is to be seen for its painted ceiling and its beautiful frescoes depicting scenes from the life of Christ. Right next to the cathedral is the second most important building in Ostuni, the episcopal palace or Palazzo Vescovile in Italian. Built in the sixteenth century, its particularity is based on the loggia used to connect the palace to the cloister of the cathedral . A construction quite unusual and that we do not necessarily expect to find in Puglia. In any case, with the cathedral in the background or the white lanes, the place is perfect for a photo break. The interior of the palace houses the Diocesan Museum , a modern museum , opened only in summer 2017. 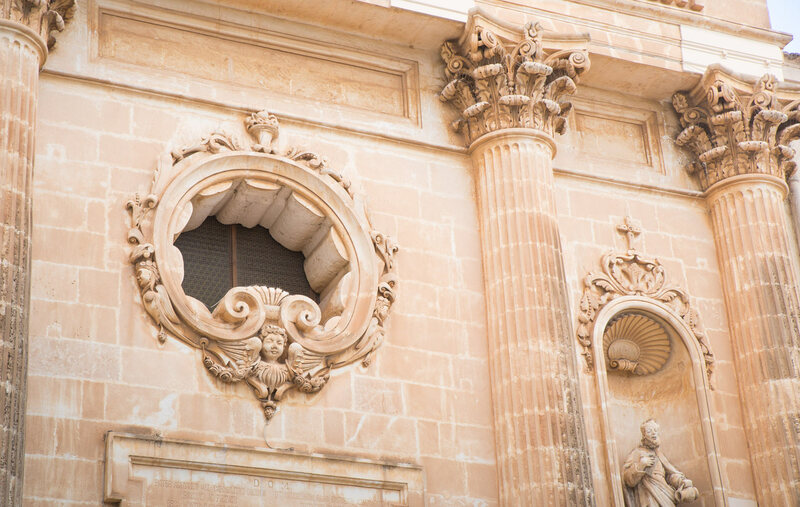 Divided into 6 sections, you can alternately admire the archaeological remains of the Messapian era, a collection of objects used by the church, paintings and a collection of books and documents retracing historic local events. 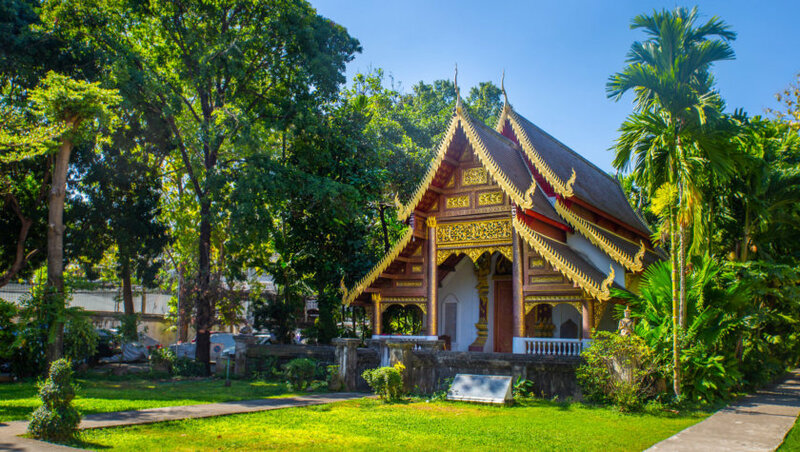 At the end of your visit, do not forget to visit the Bishop Garden , a small garden adjoining the palace and offering breathtaking views of the entire Itria Valley. Find the information for opening hours and prices on the official website (in Italian and in English). During your day trip to Ostuni, I recommend you visit the Museum of Preclassic Civilizations of Southern Murgia. Under this long name and a little barbaric, hides one of the most interesting visits to Ostuni. 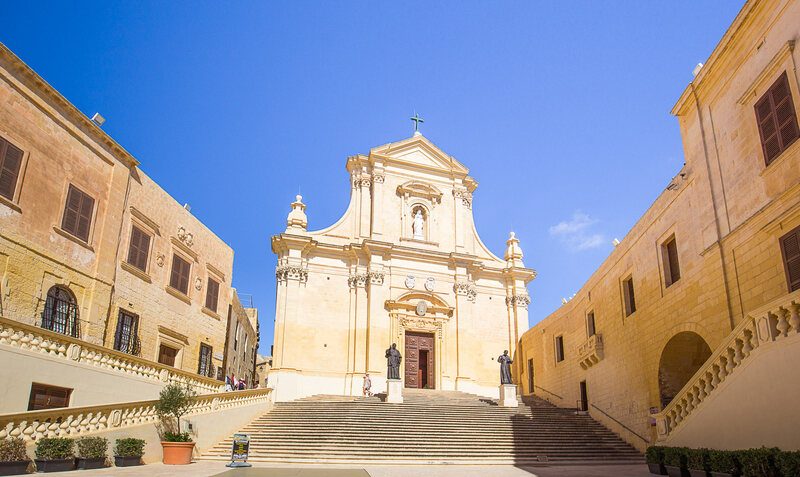 The museum is located in the center of the old town, in the old Carmelite monastery. It is home to an amazing and unique discovery in the world: the skeleton of a young woman who died in childbirth at the age of 20 and her fetus, 25,000 years old ! The young woman, nicknamed Délia and the fetus baptized Ostuni 1st were found in the cave of Santa Maria di Agnano, about ten minutes by car from Ostuni. You will be able to observe the body, found in contracted positron, the head decorated with a cape made of hundreds of small shells. Proof that Delia belonged to a group of hunters, flint and horse teeth were also found right next door. Other than that, you can also see some archaeological remains found in the caves around Ostuni. The museum is very small and can be visited quickly, to note that most explanations are in Italian. Tariff, schedules and access, it is on the official site. 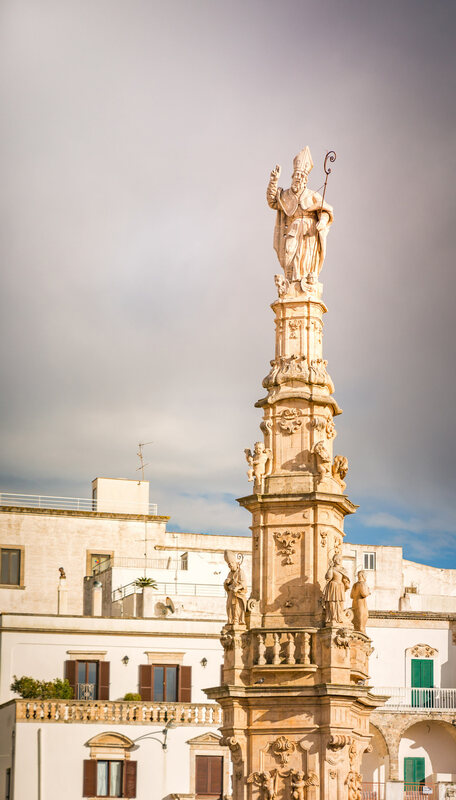 Piazza della Liberta is Ostuni’s main square , marking the entrance to the historic center. In the evening, piazza della Liberta is transformed into the ideal place of Ostuni for a drink on one of the many terraces of cafes, eat an ice cream or dine in one of the many typical restaurants of Puglia. Enjoy your visit to the square to get to the tourist office of Ostuni, located next to the municipal palace. Here you can get a map of the old town and tips on things to see around and in the Itria Valley. 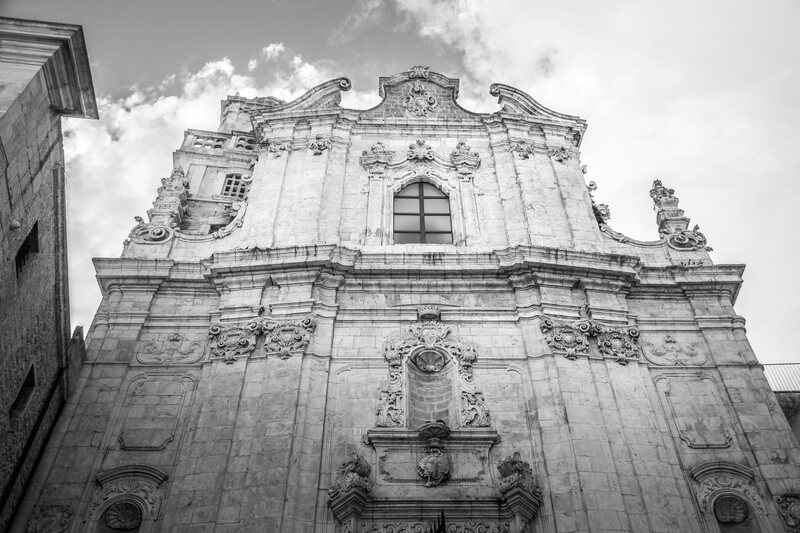 During your visit to Ostuni, and during your walk in the alleys, you will be able to admire, in addition to the cathedral, numerous churches. 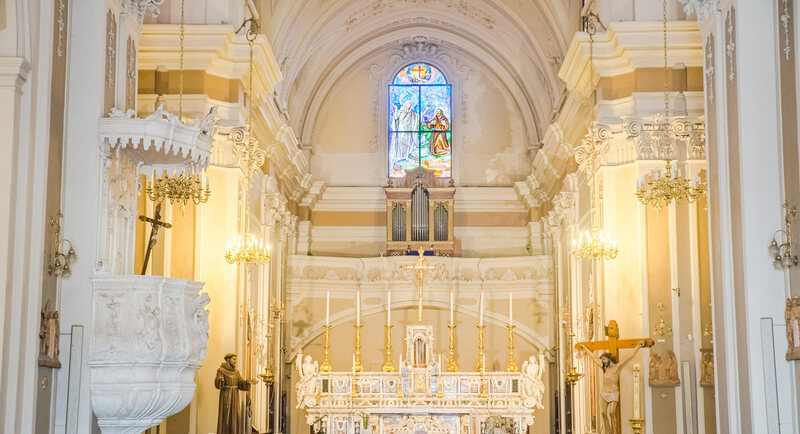 the church of Saint Francis of Assisi, built in 1304 and rebuilt in 1883, for its magnificent altar and stained glass window. The Chiesa del Carmine , and its beautiful neoclassical facade, in the lower part of the city. It is the most famous and certainly the most touristic village of the Itria Valley and Puglia , to see around Ostuni: Alberobello . From Ostuni, it takes about 45 minutes by car to reach it. Listed as World Heritage by UNESCO , Alberobello is known worldwide for its trulli, typical houses of the Puglia region. 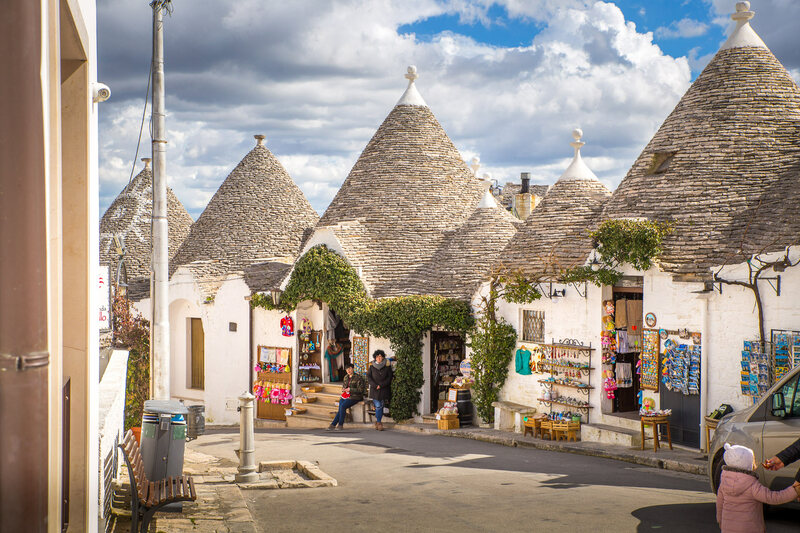 Moreover, you must have noticed before arriving at Alberobello, because the Trulli dot the surrounding countryside and the whole valley of Itria. But what is a trulli? Simply a small house with a conical roof whose walls are mounted with limestone stones then whitewashed. The particularity of Alberobello is that there are hundreds of them grouped at the same place and which gives it a unique charm to the world. The main attraction of this village is to walk in the streets to admire them. Most of them are now reconverted into souvenir shops and tourist restaurants. To know everything to do and see in Alberobello, it’s in our article: Visit Alberobello. Better to visit Alberobello early in the morning or at the end of the day, if you want to avoid crowds and sightseeing buses. Hundreds of tourists in such small streets, it spoils immediately a little charm! Between Ostuni and Alberobello, I advise you to stop in 2 villages classified among the most beautiful villages of Italy : Cisternino and Locorotondo. Cisternino is the closest to Ostuni, about twenty minutes by car. 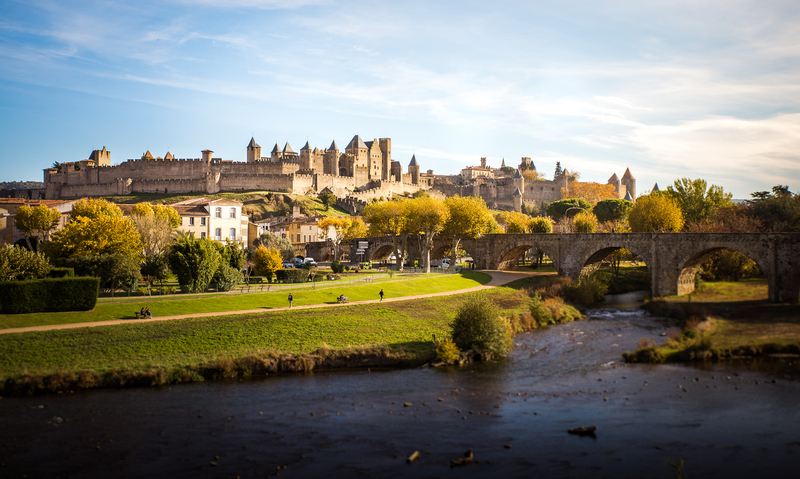 Located in the Itria Valley, its medieval center is more reminiscent of an oriental village with narrow streets, small staircases, houses with whitewashed walls and ideal places to drink an aperitif. Locorotondo is a 35-minute drive from Ostuni. Built in a circular plan, you can see several Cummerse,dwellings with rectangular base and sloping roofs covered with flat stone tiles. Dominating the entire Itria Valley, it also offers several beautiful views. 2 nice little stops to do around Ostuni! In the surroundings of Ostuni, do not miss to visit the Natural Park of the coastal dunes of Torre Canne and Torre San Leonardo. The park covers more than 1000 hectares between Ostuni territory and Fasano , in the province of Brindisi. It runs along the coast for about 8 km and can cross many landscapes : agricultural areas with pastures, olive groves, dunes or wetlands. You can choose to visit the natural park of the dunes on foot, but also on horseback, by bike or by electric car : 3 routes are proposed. Finally, to conclude this Top 10 things to do and see in and around Ostuni, direction the nature reserve of Torre Guaceto , located just 30 minutes drive from Ostuni and equidistant from Brindisi. Torre Guaceto is both a marinated protected area and a nature reserve with 8 km of coastline and landscapes alternating between creeks, wetlands, scrubland and dunes 15 meters high. You can indulge in many activities to discover: hiking, bike tours, scuba diving or sailing courses. You can also enjoy relaxing on a beautiful sandy beach with clear and clean water. With the beach of Torre Pozzella (surrounded by wild vegetation) and that of Lido Morelli (the best known near Ostuni), it is one of the most beautiful beaches to swim around Ostuni. More information on the site of the reserve. Hotel Tropical: Located 5 minutes drive from Ostuni and 10 minutes from the beach. Comfortable and colorful double room from 75 € per night, breakfast included. Pros: the location to visit Ostuni, very nice staff, private parking. Grand Hotel masseria Santa Lucia: The hotel is located about 10 minutes drive from the center of Ostuni. It is both in the countryside, quiet and close to the seaside (direct access from the hotel). Double room comfortable, bright with private terrace from 150 € (low season) up to 250 € in high season, breakfast included. The most: the superb pool, the Spa, the solarium on the beach, the calm. It’s our choice for a relaxing and relaxing stay in Ostuni! Masseria Salinola: This masseria is located just 5 minutes drive from Ostuni. It is in the countryside, in a very quiet place. The rooms and apartments are housed in a beautiful, typical building, completely renovated but respecting the original style. Cozy double room, carefully decorated from 300 € per night in high season, breakfast included. The most: the decoration, the rustic and warm charm of the place, the gargantuan breakfast (and I do not exaggerate! ), The outdoor pool, the staff very welcoming. This is our recommendation for a romantic luxury holiday in Ostuni! Impasto Napoletano: Located 200 meters from Piazza della Liberta, via Antonio Specchia. Wide choice of pizzas, hearty and delicious between 5.50 € and 8.50 €. Quick service and super nice boss, we recommend it for a good pizza. Open only in the evening. Vicolo 43 Bistro: Located via Arciduca Francesco Antonio Zaccaria. Excellent regional and Italian cuisine served in a beautiful setting. Friendly and attentive service with French speaking servers. All for an excellent quality / price ratio. Reservation recommended. Il Fienile: Located on the contrada Rosara in a beautiful old building, a little out of the way. The restaurant offers quality cuisine serving typical dishes but with a touch of originality. Excellent welcome from a dynamic and friendly team. Excellent value. To help you visualize the city a little better, I made you a tourist map of Ostuni listing the places to visit I’m talking about in this top 10 things to do in Ostuni. You can display the legend of the map by clicking on the button at the top left with a small arrow. And you, what are you going to visit in Ostuni and in the Itria Valley? 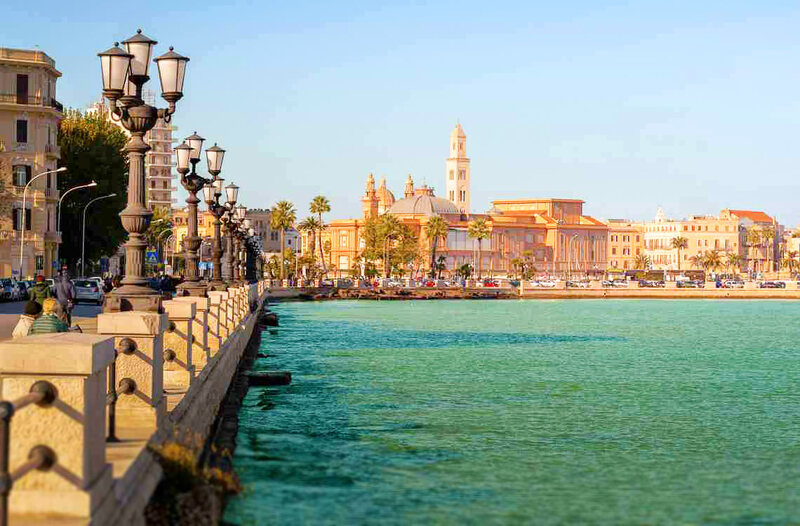 Check out all our articles about Puglia : All BonAdvisor’s articles about Puglia are listed here. Itinerary: 10 days in Puglia – How to visit Puglia in 10 days and not miss anything!